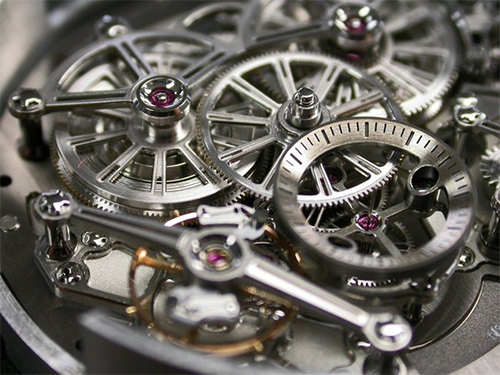 PARIS — What the Oscars are to cinema, the Geneva Watchmaking Grand Prix is to horology. For over a decade, the Geneva awards have recognized the best in each season’s crop of new watches, and the people behind them. This year, like last, the awards ceremony on Nov. 15 will be held at Geneva’s Grand Théatre, a majestic opera house known for its vast stage and elegant 19th-century Second Empire style — though much of it was rebuilt in the mid-20th century after a devastating fire. For the first time, the event will also be transmitted live to viewers at the Tourneau luxury watch store on Madison Avenue in New York. The RM 031 High Performance by Richard Mille promises a chronometric variation of just zero to 30 seconds a month. “This year we will also highlight, through projected images, the work of the talented artisans who participate in the creation of a timepiece, an object that has become a veritable work of art,” Carlo Lamprecht, chairman of the Fondation du Grand Prix de l’Horlogerie de Genève, the organizer of the awards, said by telephone from Geneva. An international jury of connoisseurs, including watchmakers, journalists and collectors — but no retailers — has already announced a shortlist of 70 watches, from 190 in competition, in seven categories that include innovation, sports, jewelry and artistic craft, and high complication. The competition is open to all brands worldwide, irrespective of price, for models introduced after March 2011, except for the “high complication” category, in which the cutoff date is set a year earlier. “The complications are more time consuming to develop so we allow the brands greater time to market their timepiece and ensure that it is in fact functional — and not just a complicated concept,” said Carine Maillard, director of the foundation, who spoke alongside Mr. Lamprecht. That challenge of innovation is particularly formidable in the complication category, celebrating the highest marvels of design and technical ingenuity. Last year’s winner, Zenith, took the high complication prize with its Academy Christophe Colomb Equation du Temps. A tribute to the adventurous spirit of the 15th-century discoverer of the Americas, the high frequency caliber drove multiple functions including the equation of time — a complication that shows the variance between solar and calendar time — and a gyroscopic carriage to neutralize wrist and arm movements. This year, Zenith is back with its Academy Minute Repeater, a watch with a musical feature that strikes the hours, quarter hours and minutes when a dedicated repeater slide is activated. In the same musical vein, Christophe Claret has been nominated in this category for its new Soprano Tourbillon, one of two Claret watches shortlisted this year, first presented this month at the Salón Internacional de la Alta Relojería in Mexico City. Mr. Claret’s X-Trem 1 has also been shortlisted, in the innovation category. The Soprano Tourbillon has a 60-second tourbillon and a four-note minute repeater that strikes Westminster Quarters on cathedral gongs; Charles X-style bridges; and a skeleton dial offering a view of its intricate interior. “We worked with a musician to obtain the four notes in the right frequency, not a simple task in a watch,” Mr. Claret said by telephone from Le Locle, Switzerland. A feature of pocket watches made during the reign of Charles X in France (1824-1830) were stepped bridges, known today as Charles X bridges, a design that the Manufacture Claret has used in several models including the Soprano. Each of the white gold or titanium versions is made in a limited edition of eight, priced at 476,000 Swiss francs, or $509,000. Greubel Forsey, the 2010 winner of the Aiguille d’Or, a special jury prize in this competition, is back this year with three shortlisted models in various categories, including the Invention 2 high complication timepiece. The Invention 2 was first marketed in 2011, following the introduction of the brand’s Inventions 1 and 3 in 2007 and 2009 respectively. “The Invention 2 has two double co-axial tourbillons, visible in transparency, driven by a central differential,” Stephen Forsey, co-founder of the brand, said by telephone from La Chaux-de-Fonds. “The mechanism offers greater precision by reducing the impact of gravity, so you get truly remarkable performance,” Mr. Forsey said. The quadruple tourbillon watch will be made in 11 pieces in red gold, he said. Each watch, decorated with unique engraving on the back, will be priced at 730,000 francs. Invention 2 packs a highly complex mechanism into an innovative asymmetrical architecture: but reading it can be a challenge. Not to be outdone in the search for complicated precision, the RM 031 High Performance by Richard Mille, a 2007 winner of the Aiguille d’Or, reflects the brand’s constant quest for improved performance. “I wanted to make a watch that was the synthesis of everything our brand has developed in watchmaking,” Mr. Mille said from Moulins, in Brittany, France, the site of his brand’s administrative offices in Brittany. “Our holy grail is to come as close as possible, with a mechanical timepiece, to the performance of an electronic watch,” he said. The high precision caliber RM 031 features a direct-impulse escapement developed by Audemars Piguet, Renaud & Papi for Audemars Piguet, that promises a chronometric variation of just zero to 30 seconds each month. “This is an object with a high level of performance,” he said. “It is sure to please those connoisseurs of haute horlogerie who are obsessed with mechanical performance.” Available in a limited edition of 10, the watch sells for €823,000, or $905,000. In a more classical register is the aptly named Renaissance from Peter Speake-Marin, a Grand Prix nominee for the first time. The watch is an open-dial architecture, tourbillon, minute-repeater encased in the brand’s iconic Piccadilly case. Since 2008, Mr. Speake-Marin, whose name was formerly associated with brands like Les Maîtres du Temps and Harry Winston, has focused on developing his own brand. The Renaissance, introduced this year at Baselworld, is a new start for the watchmaker. “It is a landmark that encapsulates my entire career,” Mr. Speake-Marin said from Bursins, Switzerland. “This watch has all the iconic elements of my work — the animation of the tourbillon, the repeater, the unique cage and the engraving in the back.” It sells for 270,000 francs.